← Another Chance to Win! A Winner! 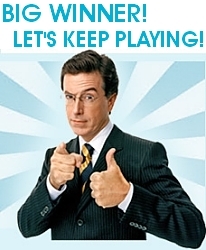 Let’s Keep Playing! On a Sphere’s Edge audio book. I am going to extend the game! Chris A. has sent me the correct answer. On a Sphere’s Edge audio book from Audible.com. This is a $19 value that you can WIN for FREE. The On a Sphere’s Edge website (onaspheresedge.com) has a lot of information about the book and the audio book. The key to the win is there. Evon Brad is the head mechanic and owner of one of Persei’s Pleasure Planet’s many space ports. Tell me the color of Evon’s shoes and WIN a FREE copy of the audio book. You do not have to sign-up for anything. You do not need to have an Audible account. All you need to do is send me the answer. 1. You must email/message me with the answer. There is an email link on the On a Sphere’s Edge website, or you can find Facebook and Twitter links on the website and at Amazon, Kobo, and Audible, or on my blog (blogyinyang.com). 2. You must include your name and email address. Without a valid email address, how can I get the FREE audio book to you? This is what dreams are made of. Good luck. This entry was posted in On a Sphere's Edge and tagged Sphere's Edge. Bookmark the permalink.